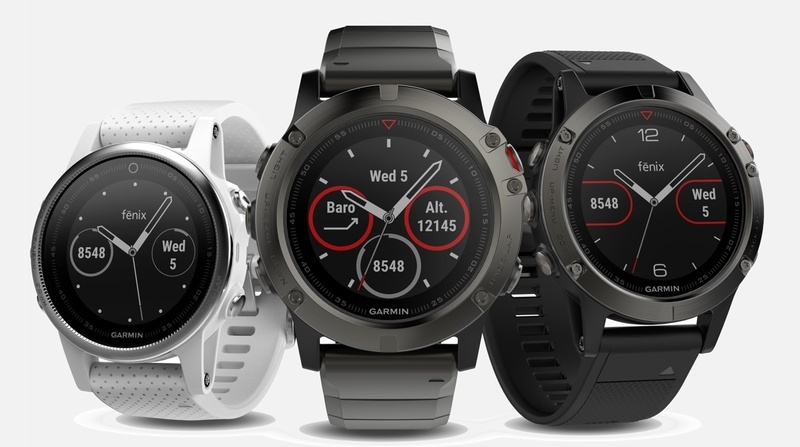 The Garmin Fenix 5 is one of the most advanced sports watches you can buy, and it's jam-packed with features for running, cycling, swimming, golf and even skydiving. But so many of the Fenix 5's best features are buried within sub-menus and can be a little complex find. After using the Fenix 5 for some time now, we've uncovered some of our favourite features, tips and little tricks that really elevate it to the upper echelons of fitness tech. We've also got familiar with the new Fenix 5 Plus, which adds fully routable TOPO maps, onboard music and Garmin Pay. The tips below all apply to the Plus as well, though we've sprinkled in a few Plus-specific tricks for those of you rocking the newer model. Got a question about the Fenix 5? Let us know in the comments below. The Fenix 5 comes with a host of watch faces you can switch between, with everything from digital and analogue styles to choose from, including complications for steps and date. To browse the selection just hold the up/menu button and select Watch Face. Use the up and down buttons to browse watch faces. You can also access Connect IQ for loads more watch faces. You can add GPX/TPX routes of runs and walks onto your Fenix 5, which is great for building a pre-planned route in a new area. First download Garmin Basecamp from the Garmin website. Once installed, connect Fenix 5 to your PC/Mac. Import the GPX or TCX file into Basecamp, and then export it directly to the Fenix 5. You can browse to the Garmin > New files. The course will then appear on the Fenix 5 when you choose an activity type. When you choose your sport head to the Main menu > Navigation > Courses. Check out our full step-by-step guide to adding GPX maps to your Garmin. The widgets on your Fenix 5 can be accessed by pressing the down button at 7 o'clock, where you can cycle between information on workouts, fitness levels, daily activity, as well as weather and notification data. You can reorder these widgets to make getting the right information easier. Choose the widget you want to move and hold the menu/up button. Choose Reorder Widget and then scroll up or down to replace it within the list. Gone out on a mazy run or cycle and now need to find your way home? There's a hidden little feature on the Fenix 5 that will guide you back. Sadly, it's not some kind of Google Maps route finder, but it will use a nifty arrow to guide you back along the route you took, which can get you out of a fix when you're lost on the mean streets of South Central LA, or Penge East here in London. When you're mid-run just press and hold the up/menu button (at 9 o'clock) and head to Navigation > Back to Start. It will default to the map screen, and show a big arrow of the direction you need to take. If you head off in the wrong direction, the Fenix 5 will tell you about it, in no uncertain terms. When you first set up your Fenix you'll be given a serious of sports to choose from, which will make up your main menu, accessed by pressing the Start button (at 2 o'clock). But what's that? You forgot to add urban paddle-boarding? No worries, just head to the menu and choose the +Add option. You can then access the full list of sports. Say again? You can't find Extreme Ironing? Try Garmin Connect IQ. Head to your Garmin Connect app and go to settings > Connect IQ. From there you browse apps including new sports including sailing and basketball. Much has been made of the battery life of the Fenix 5, especially when walking. The company claims you can get 60 hours battery life in UltraTrac mode, but you might be surprised that it's not on by default in hiking mode. You can turn it on by pressing the menu/up button at 9 o'clock and heading to Hike Settings > GPS and then pressing the Start button. Choose UltraTrac from the list. You can log heart rate variability in the Fenix 5 by using a chest strap. The data will give you an insight into your readiness for exercise and whether or not you should take a rest day. Ensure your ANT+ or Bluetooth chest strap is hooked up and go to the main menu and choose HRV test from the list of sports. You'll get a traffic light coded stress score for your body, which should advise you whether to hit that interval session or not. One of the benefits of the Fenix 5 Plus is that you can load music onto the watch, allowing you to leave your phone at home and still listen to those workout tunes. One way to browse your music is to scroll to the music widget from the watch face, but what if you've already started your workout? Simply hold the down button - that's the bottom button on the left side - and it will jump directly to the music player. You're welcome. If you've kitted out your home with Samsung smart home kit, you can now control them from your Fenix 5. The Samsung SmartThings app is available from the Connect IQ store and will let you control lighting, TV, kitchen appliances and pretty much anything else you have hooked up to your central SmartThings hub. Once the app is downloaded and you've signed into your SmartThings account, you'll be able to select a range of Routines to start taking control. Garmin recently updated its devices with something called Physio TrueUP, which syncs workouts across all of your Garmin devices. So for example, if you did a run with the Vivoactive 3 Music, the data from that run will be sent to your Fenix 5 also (so long as Physio TrueUp is enabled), so you can view it on there too. To enable Physio TrueUp, head to your device settings in the Garmin Connect app. Scroll down to General and toggle Physio TrueUp to on. Remember, you'll need to do this for each device you want to sync. Look, sometimes you're with friends or family, you get a notification come through on your wrist, and suddenly and suddenly your embarrassing sext is on display for everyone to see. The Plus adds a new privacy feature that stops the actual message displaying until you press a button or turn your wrist. To enable this feature, go to Settings on the watch, scroll down to Phone, then down to Smart Notifications. Scroll down to Privacy, which is set to off by default, and choose to open messages either with a push of the Start button or with a "Gesture", which in this case is a turn of your wrist. You can also build routes yourself in the Garmin Connect desktop app, which can be uploaded to the watch. It's great for plotting city runs, when you're not too sure where you're heading. Go to the Garmin Connect desktop app and choose Courses from the main menu. It's a little convoluted but stick in a postcode for the starting point and then zoom in. Click to place a waypoint at your start and then carefully plot out your route. You can toggle on Heatmaps if you need a little inspiration. Save the route when you're done and select Send to Device. Choose a device from the list. When that's done, you'll need to attach your device to your PC and then wait for it to sync. Start your chosen activity and then head to the menu and choose Navigation > Courses and select it from the list. Routable TOPO maps on the Fenix 5 Plus afford much richer information about what's around you. That doesn't just mean contour lines and better routing; Garmin has a Points of Interest feature that digs out all manner of things, from restaurants and shopping locations to more essential locations like hotels and hospitals. To get to there, hit the Start button as if you were about to begin an activity and scroll down to Navigate. Tap on that and you'll see the option for Points of Interest. There's also an option below it called Around Me, which instead shows you everything of note in the nearby vicinity plotted on the map. A new feature to the Fenix 5 is the ability to get live Strava segments displayed on your watch. First you need a premium Strava sub and have your Garmin and Strava accounts connected, which can be done at strava.com – check out guide here. You'll now need to go for a run and sync a run to Strava. Once that's done, check out your activity and star any segments you want to race in the future. Head to the Activity Menu > My Segments and set a goal for the segment for next time you run. This data will be synced to your Fenix 5, and when you approach the segment in future, you'll be notified on your watch. What's more, you'll be able to view any records, PBs, goals, or friends who are a little faster than you. You can do a lactate threshold test on your Garmin Fenix 5 which can help you work out your fitness levels and how hard you can push in your training or race. You'll need to pair an ANT+ or Bluetooth HR strap and also have a VO2 Max score logged, which essentially means you should have run before. Start a run and then press the up/menu and choose My Stats > Lactate Threshold. You'll then be guided through a test to get your lactate threshold score. A great feature buried on the Fenix 5 is the ability to race your own previous runs, which adds an extra edge to stale routes. To get started just Hold UP/menu, select Training > Race an Activity. You can then choose a route from your history or Courses list. You'll see your virtual partner on screen who will indicate your finishing time. Don't fall behind! You can save your location at any time by holding down the light button (top left) and then scrolling to Save Location. You'll be able to tag it, give it an icon and even adjust the coordinates. Extreme ironing may be funny but ashamed to see surfing was not available unless I copy an existing sport like paddle boarding and add a data field called surf tracker. It's doesn't do what I what.